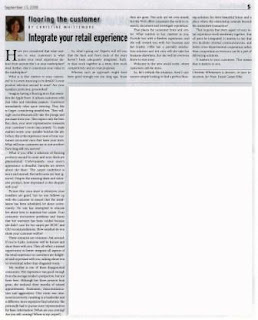 This article, titled "Integrate Your Retail Experience!" appeared in the September 15, 2008 issue of Floor Covering Weekly. Have you considered that what matters to your customers is what makes your retail experience distinct from anyone else’s in your marketplace? And, further, that it constitutes your value in the marketplace? What is it that matters to your customers? Is it a store stunning in its details? Is product selection second to none? Are your installers perfection personified? Imagine having a flooring store that resembles The Apple Store. It infuses customers with Zen vibes and relentless passion. Customers immediately relax upon entering. They like to linger, considering possibilities. They willingly and enthusiastically take the plunge and purchase from you. They expect only the best. But, then, your store representative measures your customer’s room inaccurately. To make matters worse, your installer botches the job. In fact, this is the experience most of your customers encounter once they leave your store. What will your customers say to one another? How long will you survive? What if you offer a selection of flooring products second to none and your deals are phenomenal. Unfortunately, your store's appearance is dreadful. Samples are strewn about the floor. 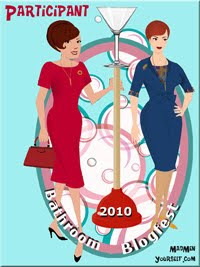 The carpet underfoot is worn and stained; the bathrooms are best ignored. Consumers must undergo fumigation after walking through it. Despite the amazing deals and extensive product, how impressed is this shopper with you? Picture this: your store is attractive; your installers are good, but no one follows up with the customer to ensure that the installation has been scheduled, let alone conveniently. No one has attempted to educate her about how to maintain her carpet. Your consumer encounters problems and learns that her warranty has been voided because she didn’t care for her carpet per IICRC and CRI recommendations. How satisfied do you think your customer will be? These scenarios are common. Ask around. If you’re lucky, someone will be honest and share them with you. They all reflect a missed opportunity to better integrate all aspects of the retail experience so customers are delighted and impressed with us, talking about us in reverential rather than disgusted tones. My mother is one of these disappointed consumers. Her experience was good enough from the average retailer’s perspective, but not from hers. Although her three projects look great, she endured three months of missed appointments, frustration, miscommunication and aggravation. One room was measured incorrectly, resulting in a backorder and a different, more expensive final solution. She personally had to pursue store representatives for basic information [when are you coming? Are you still coming? Where is my carpet?]. So, what’s going on? Experts will tell you that the back and front ends of the store experience haven’t been adequately integrated. Rather than work together as a team, they work competitively and at cross purposes. Whereas such an approach might have been good enough not too long ago, those days are gone. Not only are we over-stored, but the social web offers consumers the tools to research, document and investigate reputation. That places the consumer front and center. What matters to her, matters to you. Provide her with a flawless experience, and she will reward you with her business and her loyalty. Offer her a partially satisfactory solution and not only will she take her business elsewhere, but she will let everyone know to stay away. Welcome to the new world order, where customers call the shots! So, let’s rethink the situation. Aren’t consumers simply looking to find a perfect flooring solution for their beautiful home and a place where the relationship extends beyond the immediate transaction? That requires that every aspect of your retail experience work seamlessly together, that all parts be integrated. It matters to her that you facilitate internal communications, and foster cross-departmental cooperation rather than competition so everyone can be a part of delivering solutions. It matters to your customers. That means that it matters to you. Happy Holidays From Flooring The Consumer!